Stained glass lighting will spread gorgeous color throughout any space and bring joy and a peaceful mood. Stained Glass Lamps from Stained Glass Inc.
Light affects both how we see and how we feel. One can easily create a joyous, colorful atmosphere with stained glass lighting from Stained Glass Inc.
Stained glass lamps have the power to dramatically influence the look and feel of your church or home. People have long known what the scientific research now shows, that light has a profound effect on our mood, our psychology and our emotions. Stained glass lighting is similar to the light of a beautiful sunset, lifting our spirits and drawing us to contemplation. When light is combined with stained glass work through a stained glass lamp, it creates a uniquely powerful effect. Let Stained Glass Inc. create stained glass lighting through stained glass lamps for your home, church or office that will add warm beauty to your already existing décor. Since each stained glass lamp can be customized and built from scratch, the colors and design options are virtually endless. Stained Glass Inc. allows you to select from a wide range of stained glass artwork: patterns, word art, geometric, classical, parables and bible scenes, modern, and Tiffany stained glass lamp patterns. We specialize in stained glass hanging lamps, stained glass chandeliers, stained glass accent lamps, antique stained glass lamp replicas and Tiffany stained glass lamps. Our specialists can answer any questions you have concerning specific stained glass designs and technical details about stained glass lamp patterns. Our huge online catalog features stained glass works inspired by classic designs from past artists. Many are precise, museum quality, recreations of cherished designs by masters such as Tiffany and Frank Lloyd Wright.All of our designs are customizable and can be changed to fit your exact color, size and shape specifications. We also know that brighter isn't always better. Sometimes the gentle glow through stained glass gives the best combination of even illumination and atmosphere. Most lighting is measured by brightness, but brightness is only part of the story. Bright lights can cause the eye to squint and strain, but Stained Glass Inc. lighting creates a full spectrum of light that scatters and illuminates for a more comfortable and pleasant space. Your initial design consultation and quote are free of charge. We encourage you to bring light and color to your home, church or business with a custom stained glass lamp from Stained Glass Inc.
Our stained glass lighting is affordable and practical. We offer stained glass lamps that can go easily from the soft, gentle light through the stained glass diffuser to the stained glass light and a down light. Most of our fixtures use two circuit wiring. This is controlled either by two circuits or by a remote control. One is for a down light and the other is for the stained glass light. This allows you to select either the beautiful light through the stained glass only, or the additional down lighting and the stained glass lighting. Our custom stained glass lamps offer more than just beauty; they offer strength and durability that lasts. Our stained glass products are made from polymer glass that is virtually unbreakable. This polymer glass is the same material that is used in jet windows and motorcycle helmets; it looks like regular glass but with the added benefit of enduring strength. Mineral pigments are heat infused into lamp materials to ensure that color shines brightly and resists fading. As the light shines on and through our stained glass lamps color is beautifully spread throughout your space. Besides lasting color and strength, our stained glass lamps are custom made to your exact design requirements. Our custom stained glass lamps are made to the size and shape that you desire while incorporating your favorite design. They are easy to care for and require very little maintenance to keep them beautiful. Since our stained glass lighting is lead free, the “lead lines” are flush with the surface of each lamp, reducing dust and dirt buildup as well as the lead exposure that is common with other forms of stained glass. When it comes to price, Stained Glass Inc. stained glass lamps are much more affordable than those offered by our competitors. We create some of the most cost effective stained glass lamps available for homes, churches and businesses. We strive to give you incomparable service and a excellent value. Our artwork has graced the halls of five star resorts, casinos, the US Capitol, and cathedrals. 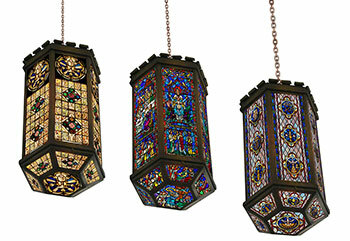 We offer unbelievable savings for those looking to add color and class by adding stained glass for lamps. Largest selection of stained glass lamp designs in the world. We work with you to create your unique lamp design. Beautiful stained glass lamps that are multifunctional. Bring new splendor to existing rooms and decor. Add charm and warmth to your home, church or cathedral. More than thirty years of experience. Up to 250 times the strength of ordinary glass. Shimmering mineral pigments are heat fused to polymer glass to ensure lasting color that resists fading. Shipped studio direct to save you money. 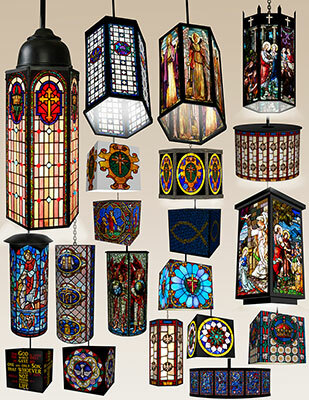 Want to add stained glass lamps to your home, church or office décor? Contact us at Stained Glass Inc. and we’ll work with you to create the perfect design for your needs.